Back in the day, Dan and I suffered from a pattern that many other couples I know have found themselves stuck in. We called it The Friday Night Fight. After a long week, 10-12 hour days and dealing with folks who... let's just say found themselves surprised it was Friday, and just realized they had things they needed to do this week but hadn't, or whatever the reason they were rude or unprepared all day long... well, Dan and I would find ourselves on Friday night a bit frustrated, fried, and easily irritated. This isn't really a great state of mind to go into a date with, and that's where we'd get ourselves in trouble. We'd try to plan these big dates and end up frustrated with each other when we missed movies or had to wait 45 minutes for a table. It didn't take us long to recognize the problem and fix it. We're pro-active folks and career activists, after all. Hence the development of the New Friday Philosophy (Ol' Abe, The Great Orator, said it better than I could). No longer would our Friday nights hang under the shadow of "A Plan" or attempts at a "Date Night". We'd get off work when we were done, come home, and play some nerdtastical game till the wee hours of morning, because we had the luxury of sleeping in. We even introduced Gardein Beef Burritos with extra Guacamole from a local spot Dan can stop by on the way home so we could skip doing dishes. Basically we would just be excellent! It didn't take long for Friday to become the best night of the week. I think that's why at our house, Mexican food always brings with it a relaxing happiness. We dance little jigs as we cook it, and we eat way more than we should in one sitting. We go to bed those nights with big smiles, and wake up excited for the next Friday. Dan made Betty's Limeade to go with this Mexican themed dish, and together we made a perfect meal for a summer night and brought a little of our New Friday Philosophy to the middle of this very long week. In a small bowl, mix the Chili Pepper, Salt, Pepper and Cumin. Lightly sprinkle the herb mix over both sides of the Fake Chicken. In your brave little cast iron skillet, heat the Olive Oil over a medium heat. Cook the Fake Chicken in the heated Oil, flipping it a few times so it's browned on both sides. Then, take the Fake Chicken out of the skillet and toss in the Black Beans, Corn, Salsa, Splash of Beer, Splash of Lemon Juice, Cilantro and Braggs. Mix the ingredients and let simmer for around 10 minutes. 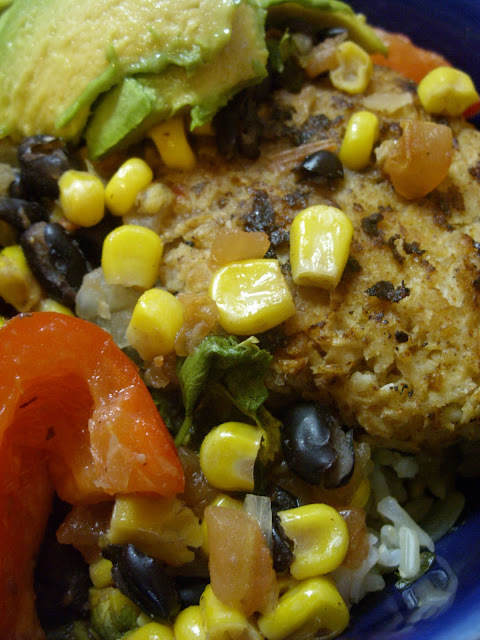 Serve the Bean Mix over Brown Rice and Fake Chicken with some fresh Avocado slices. 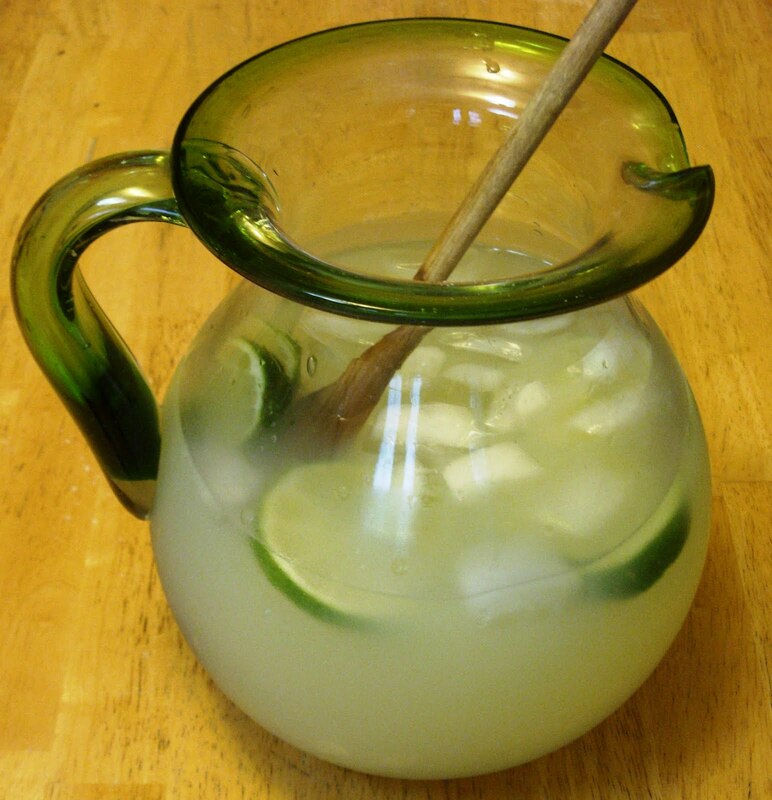 If you're lucky, you have a hero in your life who will make a big pitcher of Betty's Limeade to drink this dish with! I have one of those. In a larger pitcher, stir Water, Lime Juice and Sugar until the Sugar dissolves. Toss the Lime Slices. Serve over Ice and be prepared for unlimited gratitude and undying loyalty from whoever you hand a tall cool glass of this to. *For the record, we never fight physically. I just really like Mr.T. Totally attempting to make this tonight with whatever I have on hand! Well the Braggs adds the "salt" - you can substitute a little less soy sauce or salt. If you go with just plain salt - I would add it 1/2 a teaspoon at a time till it tastes the way you would like it too rather than just adding the full Tablespoon. Come back and comment and tell me what you think! I'd love the feedback!